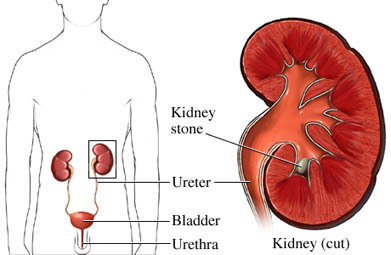 Electrohydraulic lithotripsy is one of many methods to treat kidney stones. It uses an electrohydraulic device with a flexible probe to deliver electricity that breaks apart the stones. Your risk of complications may increase if you have bleeding disorders or are taking medications that reduce blood clotting. Arrange for a ride home from the care center. If instructed by your doctor, do not eat or drink for 8 hours before the procedure. Your doctor will place a tiny flexible probe through your urethra and up the ureter toward the stone. The probe has two electrodes at the end. Images will help locate the stone. After the stone is located, the device will be used. An electrical spark will break the stone. A special basket or forceps may be used to grab the stone fragments and remove them. The stone fragments may be allowed to pass in the urine. Depending on the size of the stone, more than one probe may be used. A stent may be placed in the ureter. It will help protect the lining while the stone fragments pass or damage is being repaired. There may be fragments that are too large to pass after the procedure. These can be treated again with lithotripsy. Anesthesia prevents pain during the procedure. Pain and discomfort after the procedure can be managed with medications. This procedure is usually done in an outpatient setting. In most cases, there will be no hospital stay. You will be monitored as you recover from anesthesia. Pain medication will be given. You may be asked to get up and walk around before leaving the care center. Be sure to drink plenty of water in the weeks after the procedure. This will help the stone pieces to pass. Cystoscopy & ureteroscopy. National Institute of Diabetes and Digestive and Kidney Diseases website. Available at: https://www.niddk.nih.gov/health-information/diagnostic-tests/cystoscopy-ureteroscopy. Updated June 2015. Accessed March 8, 2018. Kidney stones. National Institute of Diabetes and Digestive and Kidney Diseases website. Available at: https://www.niddk.nih.gov/health-information/urologic-diseases/kidney-stones. Accessed March 8, 2018. Nephrolithiasis. EBSCO DynaMed Plus website. Available at: http://www.dynamed.com/topics/dmp~AN~T114904/Nephrolithiasis. Updated February 5, 2018. Accessed March 8, 2018. Ureteroscopy. National Kidney Foundation website. Available at: https://www.kidney.org/atoz/content/kidneystones%5Fureteroscopy. Accessed March 8, 2018.